Nissan loads its various Sentra models with extra standard equipment for 2015, and adds four new exterior paint color choices. The 2015 Sentra is offered in S, SV, SR, and SL trim levels. This year, the S model gains standard Bluetooth hands-free calling, a USB connection, cruise control, steering wheel controls for the stereo, and smart automatic headlights as standard equipment. 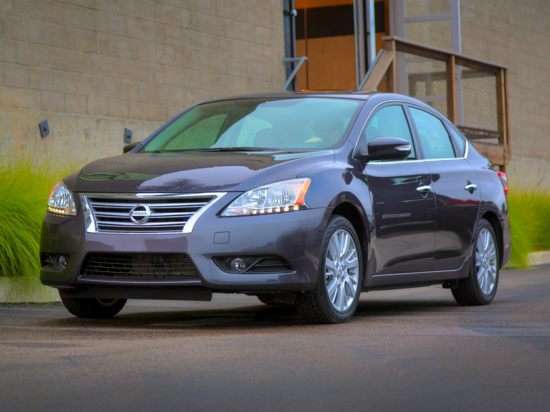 Additionally, for 2015, Nissan offers its Fuel Economy Plus (FE+) package only on the Sentra S.
The Sentra SV is equipped with a standard continuously variable transmission (CVT), and adds a number of new features for 2015. They include a sliding center armrest, a leather-wrapped steering wheel and shift knob, Nissan Intelligent Key passive entry with push-button engine starting, and an upgraded audio system with satellite radio. The Sentra SV also now includes NissanConnect with Mobile Apps technology, including a 5-inch color infotainment display screen, a reversing camera, Bluetooth streaming audio capability, and a text-messaging assistant. For sporty looks, choose the Sentra SR, which is equipped like the Sentra SV but adds 17-inch aluminum wheels, rear disc brakes, subtle styling changes, a rear spoiler, and special premium sport cloth for the seats. The Sentra SL tops the lineup, gaining leather upholstery, heated front seats, and rear disc brakes as standard equipment for 2015. Every Sentra is equipped with a 1.8-liter 4-cylinder engine making 130 horsepower. The base Sentra S features a 6-speed manual transmission, while all other models are equipped with a CVT. The CVT is an option for the Sentra S.
The Sentra S with a manual transmission is rated to get 30 mpg in combined driving. Other Sentra models are expected to achieve 33 mpg in combined city and highway driving. A Fuel Economy Plus (FE+) Package is offered for the Sentra S, adding a CVT, low rolling resistance tires, a rear spoiler, and front air deflectors in order to squeeze every last mile out of a gallon of gas. As a result, Sentras with this option earn a combined rating of 34 mpg. The NHTSA gives the Sentra a 4-star overall crash-test rating, but it should be noted that front passenger protection in a frontal-impact collision rates 3 stars. In crash tests conducted by the Insurance Institute for Highway Safety (IIHS), the Sentra gets top marks in all crash tests except the small overlap frontal-impact assessment, for which the car is assigned a “Poor” rating. Note that these crash-test results pertain to the 2014 Sentra. As this summary was written, neither organization had carried these ratings forward for the 2015 models. However, Nissan also hasn’t announced any structural changes that would improve the ratings. With the dramatic improvement in standard features across the 2015 Sentra lineup, this compact sedan is more sophisticated than ever. In particular, we’re fans of the smart automatic headlights, which are linked to the wipers to ensure than they illuminated when it’s raining outside. A text-messaging assistant is also now standard for all but the base Sentra.